St. Vincent is, and always has been, a beautiful amalgamation of a flashy, gaudy 80's pop star, a thoughtful indie artist, and a musician with a penchant for all things avant-garde. Needless to say, Annie Clark is ineffably weird, incurably bizarre, and unabashedly strange; an artist who's musical endeavors make her impossible to pin down and examine closely. 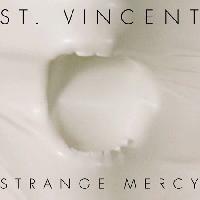 Instead, it's easier to just listen without making sense of anything, because when approaching St. Vincent, and namely her newest record, Strange Mercy, it's best just to go along for the ride. And what a ride it is. Strange Mercy can best be described as an indie-pop affair, with a multitude of sounds and influences thrown in. Frankly that's what makes the record such a treat--it's stunningly filled with surprises. It's equal parts jovial, somber, perplexing, and unsettling. It's a whirlwind of emotions, boasting many different feelings and moods. In a way, it's like we as listeners are falling deep into the rabbit hole that is the mind of St. Vincent, mind-boggling thoughts and all. While Clark does a commendable job creating a moody atmosphere, it's the music that's truly the backbone of the entire project. There's so much to Strange Mercy that it's rather difficult to describe. Truly, it's an album that needs to be heard to be understood. Spacy electronics dance along melancholy vocals, only to give way poppy, upbeat syths. Clark's warped, layered, Bjork-esque voice adds so much to every track that it's easily the crux of the record. Dark, lovely, and soulful, Clark's voice is simply exceptional, and the variation and range is something to admire. Strange Mercy is the most complex, but ultimately most enjoyable pop record of the year. Yes it's uncompromisingly weird, but one doesn't go to St. Vincent for convention. After all, it's the strangeness that makes Strange Mercy so damn beautiful, and so damn unforgettable.